Save $1,500 to $3,000 per couple off this river cruise. Click here for eligible departures. *Austrian Alps & Sound of Music Tour is offered when Eagle’s Nest Tour is not available during April, May, and November. 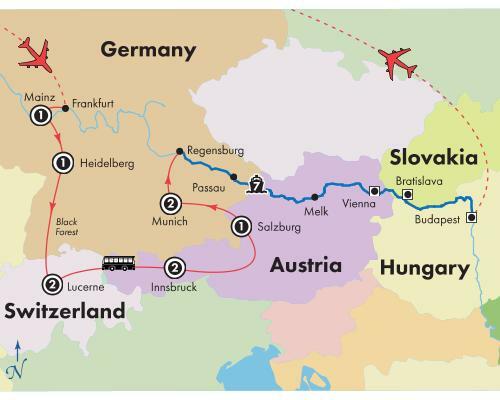 September 5 departure will stay at the Hotel Ramada Innsbruck instead of the Grauer Baer Hotel or Innsbruck Hotel. This moderately active trip covers a fair amount of ground each day. Expect from three to four hours walking every touring day. The pace is moderate, however you will encounter some uneven surfaces, stairs, steps and significant slopes. This is a Classic program. There is a potential for a small number of sailings to be impacted by river water levels, or other factors which may impact safe navigation. This may cause part or all of the cruise itinerary to be operated by motor coach and may also involve hotel accommodations. This is a Classic program.